Long known to be a finite source of energy, fossil fuels have not really “peaked” and dried up as once predicted in the 1970s. The development of shale oil and newly found sources of natural gas in recent years promise an extended period of abundant, cheap fossil fuels, and experts predict that North America might be energy independent by the next decade. Yet, the world’s continued use of fossil fuels will only vent more greenhouse gases (GHGs) like carbon dioxide (CO2) into earth’s atmosphere. According to the United States Environmental Protection Agency (EPA), GHGs pose “significant risks to humans and the environment.” In its report, “Climate Change in the United States: Benefits of Global Action,” the EPA estimates that in the U.S. alone, billions of dollars and thousands of lives can be saved with GHG mitigation efforts. Mitigation examples include phasing out fossil fuels and replacing them with alternative fuels (such as hydrogen and biomass sources) and renewable energy (solar, geothermal and wind for example). Other mitigation actions include expanding forests to remove greater amounts of carbon dioxide from the atmosphere or using production methods that reduce emissions. One alternative fuel that has gained worldwide support is hydrogen. NASA has used hydrogen to power the space program since 1958, and giant carmakers Toyota and Honda are already marketing cars that run on hydrogen fuel cells. 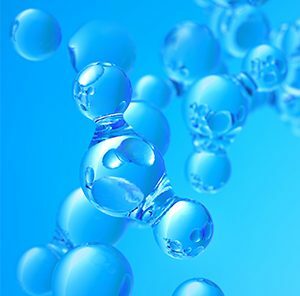 The most abundant element in the universe, hydrogen makes up more than 90 percent of all known matter. Odorless, colorless and non-toxic, hydrogen is the lightest and smallest element. Hydrogen is also non-corrosive, but it can make some metals brittle. It becomes a gas under atmospheric conditions and is about 14 times lighter than air and 57 times lighter than gasoline vapor. When released into an open area, hydrogen quickly rises and disperses. Why hydrogen? According to the U.S. Department of Energy (DOE), hydrogen holds promise for growth in both the stationary and transportation energy sectors. It can be produced from diverse domestic resources. A hydrogen-powered fuel cell vehicle produces zero GHG emissions; the only byproducts are water vapor and warm air. Hydrogen is not an energy source, but an energy carrier like electricity, and it only exists in combination with other elements. For example, hydrogen combines with oxygen to form water; it combines with hydrocarbon chains to form fossil fuels. The energy in 2.2 pounds (1 kilogram) of hydrogen gas is equivalent to the energy in 1 gallon (3.79 liters) of gasoline. Scientists have developed different methods to separate hydrogen from its combined forms (such as water and natural gas) using solar power, fossil fuels or nuclear energy. Hydrogen can be rejoined with oxygen to run an internal combustion engine or (more popularly) used in a fuel cell to generate electric power for devices such as computers or electric cars. Currently, the most widely used hydrogen production process is steam methane reformation (SMR), but the process also produces a lot of CO2, known to contribute to the global rise in temperature more than all other greenhouse gases combined. The atmospheric lifetime of CO2 is also longer (hundreds to thousands of years), and in high concentrations, it is deadly. With the SMR process, about 10 tons of CO2 results from the production of 1 ton of hydrogen. In comparison to SMR, an invention developed by researchers at UCF’s Florida Solar Energy Center offers a cleaner way to produce hydrogen. The invention introduces a new type of solar thermochemical water splitting cycles method. In principal, water can be split into a hydrogen part and an oxygen part. However, the process requires a very high temperature—more than 2,000 C, or electricity, like plasma or electrolysis. One way around the high temperature requirement is to use water-splitting cycles. “So instead of splitting water in one step, you are splitting water in several steps, usually in about three or four steps,” said Nazim Muradov, Ph.D., one of the inventors. Each step uses a lower temperature. For example, the first step only requires ambient temperature; the second step requires about 800 or 900 C, and the third step requires the same. The process is analogous to climbing a flight of stairs. A person can exert a lot of energy to jump to the top step or use less energy by walking up several steps to get to the top. In the cycles, both solar photonic energy and solar thermal energy are used to ensure higher cycle efficiencies. The cycles match the energy content of the solar spectrum to the energy requirements of these cycles. For more details about the invention, refer to the technology sheet: Produce hydrogen fuel from water using solar energy. Muradov is a well-known and well-respected pioneer in hydrogen research and was recently selected to be a fellow of the National Academy of Inventors (NAI). For more information about Muradov and his current research, see this month’s faculty feature: FSEC Researcher Recognized for Inventions and Advances in Hydrogen Energy Research.